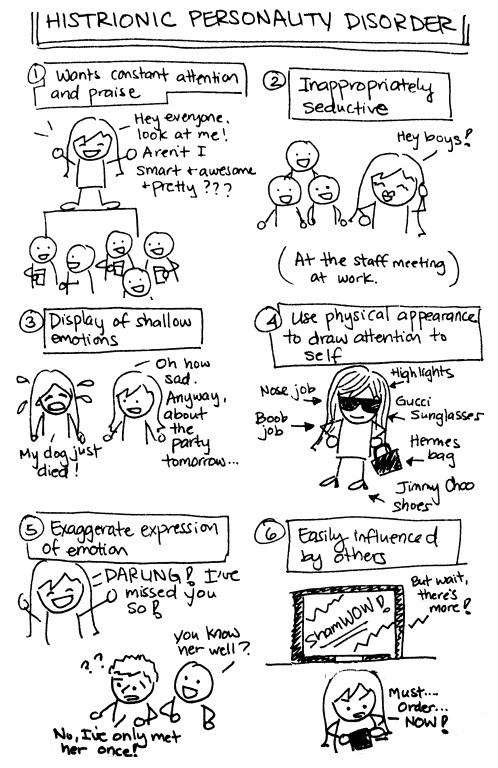 This entry was posted in attention-seeking, Cluster B personality disorders, histrionic personality disorder, hyper-emotionality, personality disorders and tagged attention-seeking, borderline personality disorder, childhood origins of HPD, Cluster B personality disorders, drama queens, histrionic personality disorder, hyper-emotionality, sexual abuse, somatic narcissism by luckyotter. Bookmark the permalink. Very informative and well-written post!!! I like your phrase “rising from abuse like vampire slayers on a mission of justice”, very poetic. Remember you will need wooden stakes, silver bullets and lots of garlic to confront those narcissists that are lurking in the Transylvanian forests. 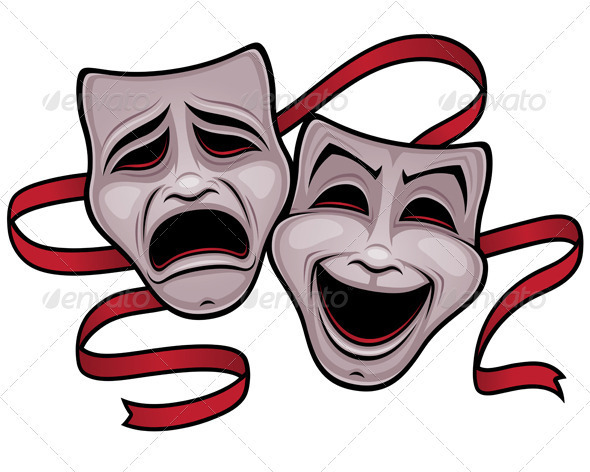 It is interesting to read those sociopath posts. My favorite sociopath is T-Bag from the show Prison Break, have you ever seen that? T-Bag is interesting because hes 99% evil and 1% redeemable; when he’s not doublecrossing or killing people; he cares (a little) about his mom. What’s your favorite? 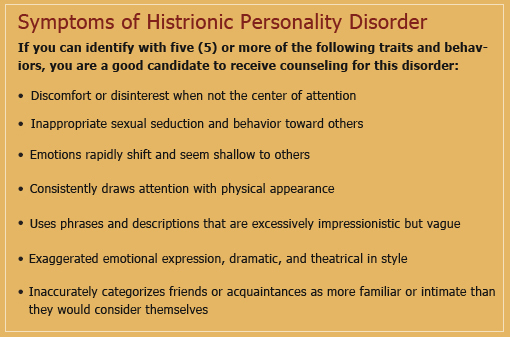 I have not even heard of histrionic personality condition being discussed for years. IMO it is hardly ever diagnosed anymore and has fallen by the wayside, even in medical model circles. There are very few books about it, unlike borderline or narcissistic conditions. It was more common in the time of Freud, early 20th century, and was not considered so negative then. And yes, I’d have the same criticisms of non-validity and non-reliability against histrionic personality disorder (as against BPD/NPD), if it’s considered as a disorder that one has or doesn’t have… I’d say that HPD, the “diagnosis”, exists just like unicorns, minotaurs and griffins do; as exaggerated caricatures in people’s minds, not in the real world of nuance and ambivalence… There are degrees of histrionic traits and ways of relating that a person can have to different degrees. It’s more important to ask why the person is acting or behaving this way, understand what brought them to this point, than to label them as having or not having some disorder. As for Vaknin, his writing about these “disorders” is totally unscientific and should be taken with a grain of salt. Vaknin’s “work” splitting and projections of his own distorted views of other people written all over it. To me it’s mainly good for entertainment, because I enjoy seeing how incredibly much he can distort reality in a matter of a few sentences. That’s interesting info you just provided in this comment. I was not aware it wasn’t even taken seriously anymore by mental health professionals as a diagnosis. I also didn’t know the label had more validity back in Freud’s day. Of course I know about Freud’s famous cases of Victorian women developing “hysterical” disorders like blindness and paralysis as a result of the societal restraints they were under. Are you sure you’re not talking about that? I only used Vaknin’s description here because I could not find another reference to anyone describing HPD as a somatic form of narcissism (unless they were actually quoting him), but it actually makes sense to me so I used it. I think most cases of “HPD” these days are either diagnosed as BPD (for women) or either NPD or BPD for men. This is just something that Vaknin fabricated, as usual. There’s no science or evidence behind it. It must be easy to make this stuff up when you are sitting at home bored to death reading about fictitious disorders all day long on your computer. Yes, in Freud’s day neuroses and hysterias were the two common problems, supposedly. Ironically, there were certainly many narcissistic and borderline people then, but the labels weren’t as widely used or medicalized as today. Again the point is that these diagnoses are not yet reliable classifications; you know that I think that. In my view, the pressure should be on psychiatrists and the APA to prove that the classification system they’re using is reliable and valid via discovery of biological underpinnings for these “disorders” and interrater agreement much higher than the kappa (agreement level between two psychiatrists on what disorder the same person has) ratings reported in the most recent DSM 5. If they can do that, it should be accepted, but that has not occurred yet. I agree that back in Frued’s day, what might be diagnosed “narcissism” or BPD now would have been diagnosed “neurosis” back then. Maybe not ASPDs though.